Group decision making can lead to improved outcomes, but only if a variety of conditions pertaining to group chemistry are satisfied. Group decisions involve two or more people, are participatory, and result in choices that are the responsibility of the group rather than any individual. Group decision making is subject to social influences that can provide advantages as well as disadvantages in decision outcomes. There are a number of potential advantages in group decision making—chief among them are shared information and more favorable outcomes achieved through synergy. Both of these advantages rely on the power of many minds undertaking a single decision. Disadvantages of group decision making include diffusion of responsibility and inefficiency. groupthink: The psychological phenomenon wherein a desire for conformity within a group results in them making an irrational decision; by actively suppressing dissenting viewpoints in the interest of minimizing conflict, group members reach a consensus without critically evaluating alternative viewpoints. Homogeneity: In the context of group decision making, homogeneity refers to a set of consistent and uniform ideas, prejudices, and beliefs held by all members within a group. Group decision making (also known as collaborative decision making) is when individuals collectively make a choice from the alternatives before them. Such decisions are not attributable to any single individual, but to the group as a whole. By definition, group decisions are participatory, and often a member’s contribution is directly proportional to the degree to which a particular decision would affect him or her. Group decisions are subject to factors such as social influence, including peer pressure, and group dynamics. These social elements can affect the process by which decisions are reached and the decision outcomes themselves. A group can make decisions by consensus, in which all members come to agreement, or it may take a majority-rules approach and select the alternative favored by most members. The sharing of information among group members is another advantage of the group decision-making process. Group decisions take into account a broader scope of information since each group member may contribute unique information and expertise. Sharing information can increase understanding, clarify issues, and facilitate movement toward a collective decision. One possible disadvantage of group decision making is that it can create a diffusion of responsibility that results in a lack of accountability for outcomes. In a sense, if everyone is responsible for a decision, then no one is. Moreover, group decisions can make it easier for members to deny personal responsibility and blame others for bad decisions. Group decisions can also be less efficient than those made by an individual. Group decisions can take additional time because there is the requirement of participation, discussion, and coordination among group members. Without good facilitation and structure, meetings can get bogged down in trivial details that may matter a lot to one person but not to the others. One of the greatest inhibitors of effective group decision making is groupthink. Groupthink is a psychological phenomenon that occurs within a group of people in which the desire for harmony or conformity results in an irrational or dysfunctional decision-making outcome. By isolating themselves from outside influences and actively suppressing dissenting viewpoints in the interest of minimizing conflict, group members reach a consensus decision without critical evaluation of alternative viewpoints. Loyalty to the group requires individuals to avoid raising controversial issues or alternative solutions, and there is a loss of individual creativity, uniqueness, and independent thinking. The dysfunctional group dynamics of the in-group produces an illusion of invulnerability (an inflated certainty that the right decision has been made). Thus the in-group significantly overrates its own decision-making abilities and significantly underrates the abilities of its opponents (the out-group). Furthermore, groupthink can produce dehumanizing actions against the out-group. 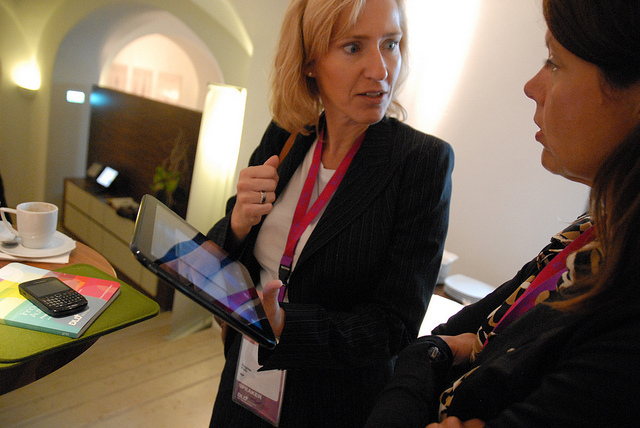 The manager’s role in group decision making is to create a supportive context for the group. The manager’s role is to establish the conditions for an effective group – decision outcome. Managers can help promote effective decision making by effectively choosing group members, framing the decision, and organizing the decision process. Productive steps a manger can take to assist group decision making include the following: define a goal, create positive working conditions, establish expectations, provide adequate resources, and give group members ample space and latitude. norms: Behaviors or standards regarded as typical. Decisions are often delegated to groups when members have the experience and information needed to arrive at the appropriate choice. Managers and leaders can take actions that support group decision making and lead to good decision outcomes. Managers can help promote effective decision making by effectively choosing group members, framing the decision, and organizing the decision process. Establish the team goal: By articulating the dimensions of the decision, including its importance, a manager can reduce ambiguity and help group members focus their analysis, discussions, and deliberations. A clear statement of the question to be resolved can help unify the group and create cohesion that engages members and improves collaboration. 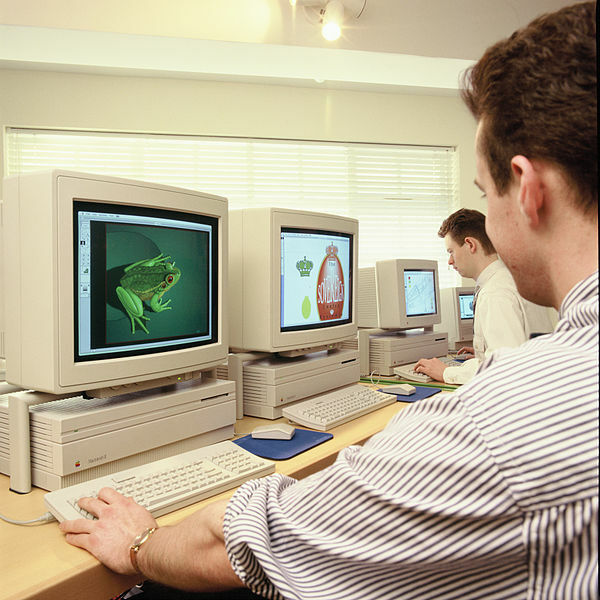 Facilitate a working environment: After the decision goal is established, the working environment must allow for meaningful, honest, and open communication among group members. The manager can help establish norms about how members will interact with each other to foster constructive discourse. Set clear expectations and responsibilities: By setting expectations, managers help team members understand their decision tasks and parameters (for example, deadlines). Managers might assign roles to help structure the decision process, establish a sense of accountability for parts of the group’s work, and clarify responsibilities. Provide resources: Managers must be mindful that the group has adequate resources to evaluate alternatives and make its decision. Necessary adjustments may include providing additional staff, giving more time, or freeing members from other work assignments so they can fully participate in the decision-making process. Get out of the way: After the manager has established the context for the group to make its decision, the best thing to do is step back and let the team perform. The most useful role at this point is that of coach, such as if the group needs help managing interpersonal relationships or if additional clarity is needed about an alternative. Manager and employee communicating: Managers can facilitate group decision making by setting clear expectations. Involving employees in key decisions gives managers access to unique skills and tells the employees that their contributions are valued. From a managerial standpoint, employee involvement is an effective way to leverage human resources and give employees a voice in something meaningful. Employee participation in decisions can lead to increased job satisfaction, organizational commitment, individual motivation, and job performance. To effectively contribute to group decisions, individuals must have relevant skills and experiences. Group decisions can lead to better decision outcomes by bringing to bear a broader range of perspectives. By delegating a decision to a group, an organization can make effective use of the skills and knowledge of its employees. Employee involvement: Managers use employee involvement in key decision making not only to leverage employees’ unique skills, but also to motivate them, signaling that their impact on the company is meaningful. Another of the benefits of group decision making in an organization is its effect on employee motivation. Providing opportunities to participate in decisions is a way to give employees a voice in something meaningful. Doing so can have positive effects on job satisfaction, organizational commitment, individual motivation, and job performance. Most commonly employees are involved in decisions that directly affect how their work is done. For instance, many quality-control practices include opportunities for workers to discuss and select ways to improve how they produce goods or deliver services. Self-managed teams have even broader responsibilities for decisions, such as how their work is organized, scheduled, and assigned. To effectively participate in group decisions, employees must have the necessary skills and experience. Without relevant knowledge, participants in group decision making may not grasp the issues, know how to analyze alternatives, or be able to determine which option to choose. For instance, it would not be reasonable to expect the same level of contribution from a new recruit fresh out of college as from a more experienced employee familiar with the organization and its business priorities. Reaching consensus typically requires identifying and addressing the underlying concerns of group members. Consensus decision making aims to reach agreement through collaboration, cooperation, inclusivity, and participation. Seeking consensus is not always ideal, since it can take additional time and result in suboptimal choices. Two approaches to making group decisions by consensus are the Quaker model and the consensus-oriented decision-making (CODM) model. consensus: A process of decision-making that seeks widespread agreement among group members. Consensus decision making aims to reach agreement through collaboration, cooperation, inclusivity, and participation. Group decisions made by consensus seek resolutions that are satisfactory to all group members and meet all of their concerns. Consensus decision making is not adversarial or competitive, but rather seeks to do what is best for the group. Group members treat each other equally and solicit the input of all participants. Making decisions by consensus is not necessarily ideal or even desirable. In an effort to please everyone, the decision may satisfy the least common denominator but not produce the best outcomes. Developing a consensus can be time consuming, and is thus more difficult to achieve when there is urgency, significant time constraints, or resource limitations. Another way to think about consensus is as the absence of objections. In order to arrive at a group consensus, majority opinion holders must overcome any unwillingness of group members to accept a given choice. While group members may be willing to go along with a proposal, they do not actually need to favor it above another choice. One approach to consensus building is the Quaker model. It provides a way to structure a decision process that emphasizes listening among group members. The Quaker model calls for members to refrain from speaking twice until after all group members have been heard from, the effect of which is to neutralize dominating personality types. Another key feature of the Quaker model is that it relies on a single person to act as the facilitator, or moderator, who makes sure the discussion flows according to an empathetic process. By articulating the emerging consensus, members can be clear on the decision as it emerges, and, since their views have been taken into account, will be likely to support it. 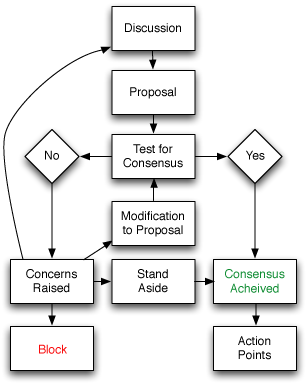 Consensus flow diagram: This diagram shows a process of steps through which consensus can be reached, by starting with concerns that are raised, moving to a discussion, then a proposal, and then further testing for consensus. The CODM model outlines a process of how proposals can be collaboratively built with the full participation of all stakeholders. This model lets groups be flexible enough to make decisions when they need to, while still following a format based on the primary values of consensus decision making.